This immaculate, skinny home is located on a cul-de-sac in the highly sought out, gated community of the Village at Blue Mountain Beach. The Village at Blue Mountain Beach Village is popular for being in a low traffic area and close by to all the shops, art galleries, world class restaurants, art and music festivals and all that 30A has to offer. The amenities are amazing. They include a huge, 5-star community pool, a fitness center, shuffle board area, buggy charging stations, grilling areas, numerous picnic areas/gazebos, bike racks, & most importantly, a strong HOA. Beach access is at the Blue Mountain public beach access at the end of Co. Hwy 83. What is a skinny house? It is a home built on a small footprint. This home is skinny and 3 stories tall, making the most of the spaceavailable. This has become a trend in downsizing and maximizing your homes footprint and efficiency living. It is beach living at a whole new level! 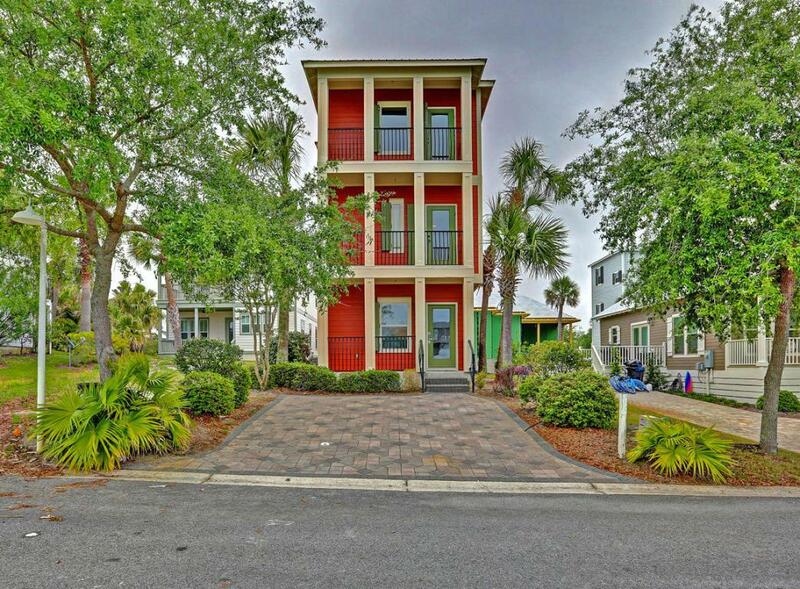 This charming 2-bedroom, 2.5 bath home is only 1,003 SF, but offers everything you could ever want in a great home at the beach. 1st floor has a guest bedroom and full bath. The vanity has a marble counter top and compliments the smaller space. The staircase leading to the 2nd and 3rd floors have oak stair-treads with beautiful granite toe-kick backs. The main living area in on the 2st floor. The living, dining area and kitchen are in one cozy space. Over-sized tile floors, an updated kitchen with stainless steel appliances, raised ceilings with crown molding and a nice covered balcony create a very desirable open space. There is a half bath with a Demilune vanity and a laundry room on this floor also. The 3rd floor has a spacious master suite with a wonderful balcony and a master bath has a double vanity. The master suite offers much privacy from the rest of the home. Every bit of space in this home is filled with marvelous upgrades and unique touches.